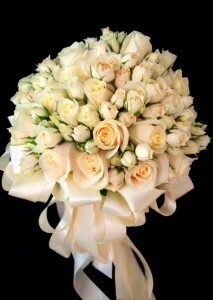 Classic wedding whites create a luxurious feel for this formal spring wedding. 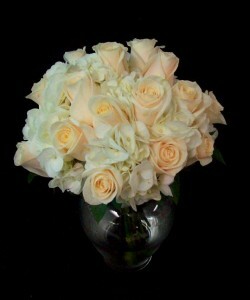 This large round hand tied is comprised of 30 creamy Vendella roses and 30 stems of ivory spray roses. Loops of ivory stain ribbon form a lush collar around the bouquet with a cascade of loops and tails toward the front. This medium hand tied bouquet was carried by the bridesmaids in this wedding but would serve beautifully as a bouquet for a bride as well. 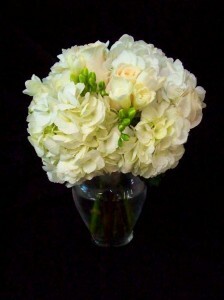 White hydrangeas and ivory Vendella Roses are paired together for a classic style bouquet. 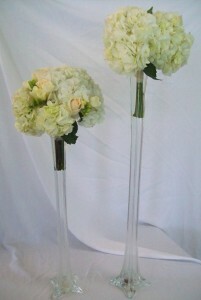 These round handtied bouquets played double duty: they were used to decorate the altar at the church and again as centerpieces at the reception. 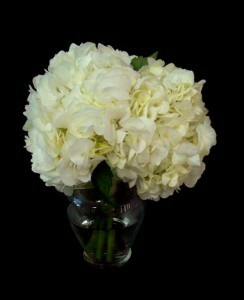 Just a few stems of white hydrangea form a simple and lush bouquet.